Photo of the reception for Norman Rockwell Museum’s 7th annual U.S. Citizenship Naturalization Ceremony, held in conjunction with Berkshire Immigration Center. 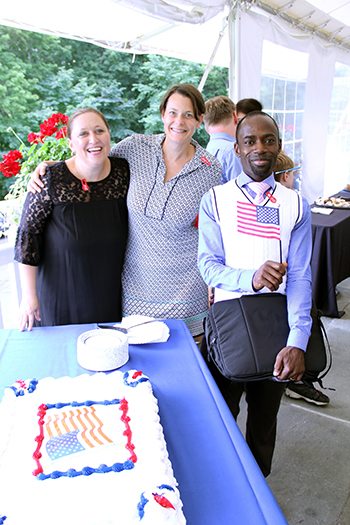 Norman Rockwell Museum was proud to once again partner with the Berkshire Immigrant Center (BIC) and host our seventh annual United States Citizenship Naturalization Ceremony at the Museum on August 10, 2018. 23 men and women, originally from 16 countries, took the oath and were sworn in against the welcoming backdrop of Norman Rockwell’s artwork. In addition, their children also became new citizens during the timely event, and families received a one-year membership to the Museum courtesy of Helen Bing. Remarks during the ceremony were also offered by Museum Director Laurie Norton Moffatt and Brooke Mead, Executive Director of BIC. Color guard was provided by the Williamstown American Legion Post 152, with singer Lina Orozco Grillon performing music during the event. This year’s ceremony was made possible with generous support from Berkshire Bank Foundation, Helen Bing, Greylock Federal Credit Union, Cain Hibbard & Myers PC, and PSYCH/Howland Associates. Other local businesses who generously donated items for the event and reception include Guido’s Fresh Marketplace, Big Y Foods, Inc., and other cultural institutions. View a photo album and video of the event on our Facebook page.